When it comes to transferring files from your Flip camera to your computer, you have several options. What you use will depend on what type of operating system you use (Windows or Mac) as well as what happens when you plug your Flip into your computer. Windows Live Photo Gallery is a part of the free Microsoft Windows Live suite of programs, which you can download at http://photos.live.com. Launch Windows Live Photo Gallery. The Sign In to Windows Live dialog box appears. Enter your Windows Live user name and password (if you have them) and click Sign In. 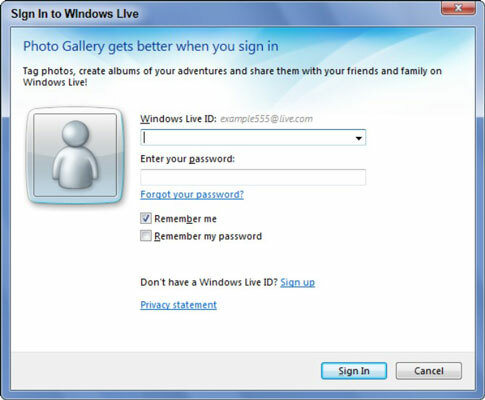 Click Cancel if you don’t have a Windows Live username or password, or you don’t want to sign in right now. The Windows Live Photo Gallery window appears. A dialog box might appear asking whether you want Windows Live Photo Gallery to open picture files instead of whatever other program is assigned to open picture files. If you want to do this, click Yes; otherwise, click No. You can also select the “Don’t Show Me This Again for These File Types” check box if you don’t want Windows Live Photo Gallery to prompt you with this dialog box every time you run the program. Plug in your Flip camera. If the AutoPlay dialog box appears with options you can choose, click “Import Pictures and Videos using Windows Live Photo Gallery.” Proceed to Step 6. If the FlipShare program launches and displays the video files stored on your Flip in the workspace window, choose File, Exit to quit FlipShare. Proceed to Step 4. If another photo or video program that you previously selected to open when you plug in your Flip prompts you to import your video files, click Cancel. Proceed to Step 4. Choose File, Import from Camera or Scanner. The first “Import Photos and Videos” dialog box appears, showing your Flip camera and any other media devices you have plugged in to your computer. Select the FLIPVIDEO icon and then click the Import button. The second “Import Photos and Videos” dialog box appears for only a moment as Windows Live Photo Gallery searches your Flip to see whether it contains any video files. The third “Import Photos and Videos” dialog box appears. Make choices in the third “Import Photos and Videos” dialog box. The fourth “Import Photos and Video” dialog appears and displays one or more video files stored on your Flip camera. Make choices in the fourth “Import Photos and Video” dialog before proceeding. The fifth “Import Photos and Video” dialog appears, displaying a progress bar as Windows Live Photo Gallery imports your video files to your computer. (Optional) Select the “Erase After Importing” check box. Windows Live Photo Gallery deletes your video files from your Flip camera after it finishes copying the files to your computer’s hard drive. When Windows Live Photo Gallery finishes importing your video files, a message inviting you to view your new photos appears.